Understanding that the soil in which we plant a tree (our children) is extremely important. Recognizing that the soil represents the prevailing worldview of the home, church, school and/or community. A secular worldview soil is filled with lies or Satan’s truth claims while a biblical worldview contains absolute truth. A secular education is grounded in a secular worldview. When a child is planted in a secular education soil, he/she will absorb the lies that are contained in the soil. Since knowing truth sets people free, then knowing lies enslave people. As we identified these keys to growing trees, we learned that it was important to be able to identify the major lies that are embedded in a secular worldview. Some of the lies that were identified are listed below. Man’s happiness is the most important goal in life. The government is to provide for all of its citizen’s needs. Gender is a personal choice. Tolerance is the ultimate value that humans are to exhibit. Man is a mere mechanistic creature of nature of equal value to all other forms of life. Making money is the primary goal of work and one works to be able to consume. Popularity is important in determining one’s identity. Creation Evolution is presented as a scientific fact. Young earth is presented as a child’s story. The government is responsible to provide all of one’s needs. Readers were asked to choose one of these lies and answer a few key questions as to the where the lie originated and some of the history behind it. The analogy was made between the development of beliefs of a person to the development of a root system of a tree. 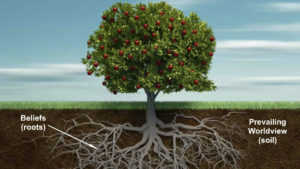 The roots of a tree will grow and expand in searching for more nutrients for the tree. In the same way, the beliefs of a child will grow and seek for more of the nutrients (lies or truth) that are in the soil in which they are planted. Today, I want us to consider what else takes place in growing a tree by looking at the trunk of the tree. As the roots absorb nutrients from the soil, these nutrients are transported through the tree’s trunk in order that the rest of the tree receives food and water. The trunk is merely a conduit and takes whatever the roots of the tree absorbs and delivers it to the branches and leaves of the tree. Based on this concept in our metaphor of a tree representing a child’s life, we can say that the trunk represents the values that the child will develop. These values provide the means through which the beliefs of the child are transported to the rest of the child’s life. I want to once again turn our attention to how this works when a child is planted in secular education soil. We learned in previous posts that secular education soil is filled with falsehoods. These falsehoods are absorbed by the child’s roots and form his/her beliefs. Whatever beliefs are developed in the root system, they are then transported through the child’s values or the trunk of his/her life to all parts of the child’s life. This leads us to consider several very important questions when it comes to how one’s beliefs end up impacting all of one’s life. As you have identified a major lie that is enslaving today’s culture, you also identified some of the dangerous beliefs that are a result of feeding no that lie. Based on the beliefs that you have identified, answer the following questions (this can be done in a group setting). How is the lie communicated? How is it passed on from one generation to another? What avenues are used to communicate this lie such as media, education, use of words/language, the arts, entertainment, laws, and or stories/jokes? It is important that Christians understand how lies become beliefs and, then, how beliefs are communicated so that they impact all of life. If you have been going through this process, share what you are learning by leaving a comment below. Even though this step is very important, next week I will show why we are witnessing certain behaviors in our homes, churches, schools and communities today.